I’m in my final preparations for my annual pilgrimage to Tornado Alley. This entry was posted in Prologue and tagged 2015, prologue on 2015-05-02 by Lisa Beal. This entry was posted in Photography, Prologue, Videography on 2013-04-15 by Lisa Beal. I left the house on time, thanks to Alfonse, my limo driver, arriving a tad early. His warm, boyish smile almost made me forget we left at 5:30 am. 45 minutes later and $60+tip poorer, I was at the terminal at O’Hare. Collecting my E-ticket, taking my two (carry-on!) bag through TSA inspection, and getting on the plane were effortless. I passed the time waiting for the plane conversing with this young man (20-something) about such topics as the flood in Louisiana, my his to Maui the previous week, Michael Jackson, basketball, and storm-chasing. I had Italian food at Portfino’s (Reno & Meridian, a few miles north of the hotel), Loved the Chicken Caccitore, minestrone soup, and the tiramisu. Service was good, though I was unclear that my soup was a substitute for my salad. Tried to find a high-end photo supply store (to get a 37mm UV protection lens for the JVC camcorder, but no luck. Tried the Walmart and Best Buy near McArthur and I-40, but to no avail. I will have to soap the thread on the 30.5-37mm step-up ring, to avoid another ‘stuck lens (like I experienced yesterday). “Proceed with caution ” applied here. Dinner was the ribs and chicken combo at Charleston’s, a really nice eatery located across the street from the motel. A 5-star taste at a 3-star price! I was in a really good mood over the Thunder advancing to the NBS Western Conference Finals. The Bulls also beat the Miami Heat (as they had during the regular season). I was thinking how cool it would be to have two talented young NBA teams (Bulls and Thunder) face each other in the NBA Finals. This entry was posted in Prologue, Travel/Positioning Day and tagged 2011, prologue, travel on 2011-05-16 by thunderblog. Another Season of active weather is in full gear, and I am ready to join the fray. Since my regular chase partner is unavailable when i have time off, I am using my fallback strategy: go with a commercial chase tour (my old favorite, Tempest Tours). Beyond that, I will be limit to weekend chases (with a long-distance trip for Independence day weekend, weather permitting). Given that my regular ‘commuter car’ — a 2001 Chevy Prizm that has never had a moment of trouble until now — is not in running condition, my chase vehicle is my temporary commute vehicle. I use a separate vehicle for chasing to avoid risk to the car I use to go to work, but cannot realistically exercise that option now. Once my tax refund arrives, I’ll fix the Prizm and revert to the old vehicle strategy. As in past years, I have done some pre-season training, highlighted by the Advanced Spotter Training seminar that DuPage County (Illinois) Emergency Management Agency (DCEMA) sponsors annually. This year, the training counts toward my biannual spotter re-certification, so I do not need to re-do the basic spotter training class. As usual, the DCEMA folks rounded up some excellent speakers and the talks were educational and informative. I even sat a few seats from a fellow survivor of the 1967 Belvidere, Illinois tornado, the storm that is probably responsible for setting my path toward storm chasing. (OPTIONAL: Insert Twister / Helen Hunt joke here. ). The annual WGN9-TV/FermiLab severe weather seminar acts as the other part of my training refresher (especially the presentations on lightning, tornado injuries, and storm safety). Some high precip storms came through the area (drenching us when we entered the build at 5pm). The local chasers were easy to identify: all had a ‘should I stay or chase’ look on their faces. Nothing like have a good storm during the storm seminar to confuse the die-hard weather weenies! The 6-10pm presentations ran so late that Ron and Cheryl Schmalz (my local chase partners) and I left early to get our first real meal of the day. 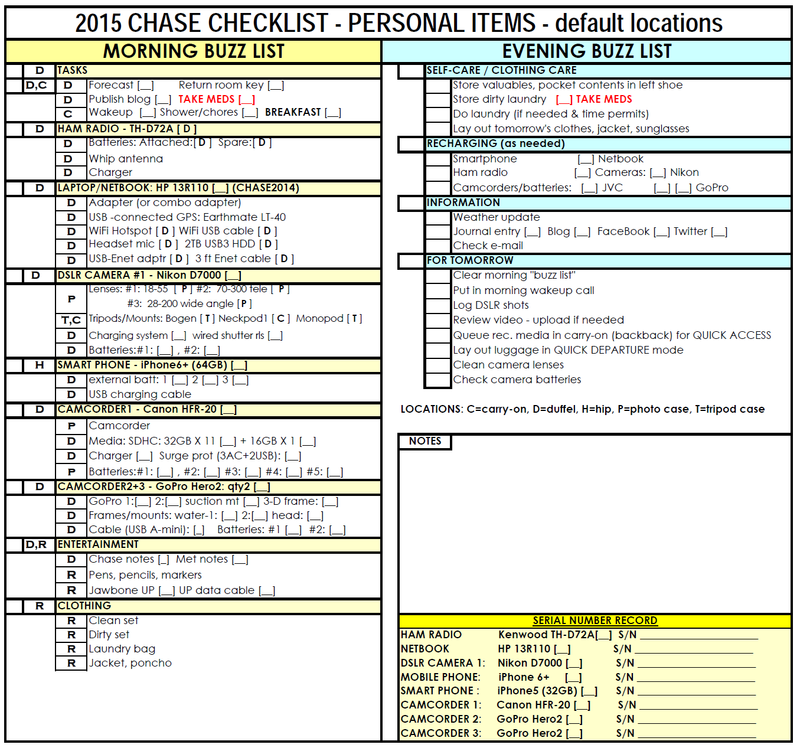 The evening meal at the local Sonic, the post-storm sounds and smells, and my van full of chaser gadgets made it feel like the end of a chase day. Cheryl was fortunate enough to win on of the weather radios that was given away. (I believe that brings the unofficial radio count for the Schmalz household to 20 or so!) I’m sure she and Ron will enjoy many hours of use from the new radio, as they are very active in storm spotting for their community. They are both terrific examples of the many selfless individuals who give their hearts and hands over to the cause of keeping their neighbors safe when the skies grow threatening. Hopefully, before the trip, I empty out the 2008 chase video from my HDD camcorder, prep my cameras (including the Pentax 14M-pixel K20-D), and get my chase laptop rebuild (as it is a bit too-crash prone to use in the field right now). 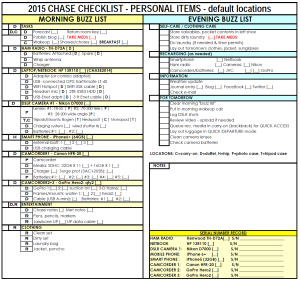 I also want to update my chase pages, espeiclly the tools section. 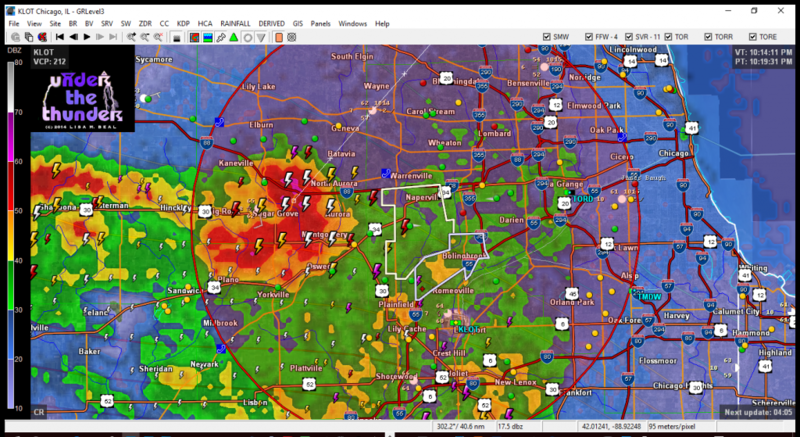 I’ll be using some Tim Vasquez weather book for inspiration in that area. This entry was posted in Prologue and tagged 2009 on 2009-05-02 by thunderblog. Crap. Just got email. We’re leaving Saturday night instead of Sunday. Hope I’m ready in time! This entry was posted in Prologue and tagged 2008 on 2008-05-23 by thunderblog. Today has been an awful day. I spent the whole morning geting my storm chase boorkmarks entered on my laptop when it started acting. In short, I lost 4+ hours of work when Foxmarks collided with a temporary file cleaner that’s part of Norton 360 protection software — at least I think that’s what happened. The local file got clobbered AND then got auto-uploaded to my.foxmarks.com before I even realized what happened. I was able to restore the web-based Foxmarks bookmarks from a backup, but I lost everything I’ve done on this project for the last two days! At least it wasn’t a hardware failure. I guess it’s a blessing in disguise that the chase team won’t leave until Sunday morning. I’ll certainly need all day tomorrow to pack, discover and fix any problems with cameras, clothing for the trip, etc.